Standard concrete mixer. Engine: Mack MP®7-425M, 425 horsepower and 1,560 lb.-ft. torque. 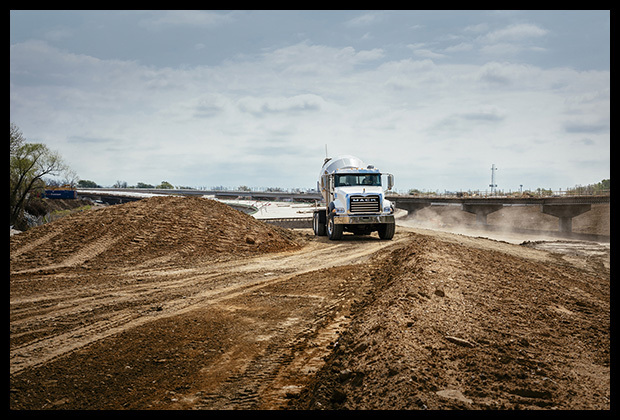 Transmission: Mack mDRIVE™ HD 14-speed automated manual transmission (AMT) with ultra-low creeper gears. Features: Mack ClearTech™ One exhaust aftertreatment system; Mack 22,500 lb. front axle; Mack 46,000 lb. rear axles; Mack Information & Entertainment system; Mack GuardDog® Connect integrated telematics. Bridge formula mixer – seven axle. Engine: Mack MP7-425M, 425 horsepower and 1,560 lb.-ft. torque. Transmission: Mack mDRIVE HD 14-speed AMT with ultra-low creeper gears. Features: Mack ClearTech One; Mack 20,000 lb. front axle; Mack 46,000 lb. rear axle; Mack GuardDog Connect. Dump body. Engine: Mack MP7-425M, 425 horsepower and 1,560 lb.-ft. torque. Transmission: Mack mDRIVE HD 14-speed AMT with ultra-low creeper gears. Features: Mack ClearTech One; Mack Camelback SS38 suspension; Mack 18,000 lb. front axle; Mack 38,000 lb. rear axle; Mack Information & Entertainment system; Mack GuardDog Connect. Concrete pumper. Engine: Mack MP7-425M, 425 horsepower and 1,560 lb.-ft. torque. Transmission: Mack T310 10-speed manual transmission. Features: Mack 20,000 lb. front axle; Mack 150/151 rear axles with Mack Camelback suspension; Mack GuardDog Connect. Concrete pumper. Engine: Mack MP7-425M, 425 horsepower and 1,560 lb.-ft. torque. Features: Mack 20,000 lb. front axle; Mack C150/151 rear axles with Mack Camelback suspension; Mack GuardDog Connect.